A group of totally not racist white people who just happen to love riding ferris wheels dressed in white robes. Amidst an assortment of posts complaining about evil brown immigrants, “Jewish Power,” and the internal politics of neo-Nazi organizations, I noticed a posting from our old friend JeremiahGuy — the latest Reddit handle of the dude once known as Things Are Bad, an MRA so obnoxious he’s been banned from r/mensights and A Voice for Men. Jeremiah links to a post on MGTOWforums –- another familiar name! — lamenting the fact that a black “fattie” has just been chosen as Homecoming Queen at the University of Mississippi – that is, the famously racist, formerly segregated school known as Ole Miss. Either the school is housed in radioactive isotopes causing deformation and them being the “Two best” beaties..Or they have that whole “Oh don’t worry you ARE beautiful! !” crowd surrounding them. Honestly though since she is the “FIRST” African American winner shes probably a token winner like obama. Either you vote for her or you are a racist kind of thing.. Or as I said before the thing I call “Oh don’t worry you are pretty!” White lie which is also part pity. Jesus though. Either choice!! I had seen prettier faces on roadkill. There’s a lot more where that came from in the MGTOWforums thread. These comments are some of the Reddit-est comments I’ve read in a long time. 2) Two people so entitled and narcissistic that they honestly believe that white people like themselves really do face oppression at the hands of minorities, yet who also honestly believe that they themselves aren’t racist, and have somehow failed to notice up until this point that they’re posting in a subreddit run by and full of neo-Nazis. I think it’s door number two. This is just one example of the casual misogyny that flourishes there, and not even a particularly egregious one. Obviously, as regular readers here know all too well, there are plenty more examples where that came from. It’s kind of amazing how easy it is for bigots to convince themselves that they’re not bigots. Ruby Dynamite: What? I mean that. I’m lost, there seems to be no connection to what you said and any of the conversation. You could have just said, “I hate women” and it would have been as useful. @pecunium, Since Ruby’s first sentence is a near quote from the OP, I suspect this was just a blockquote fail. Yeah, reads like standard snark to me. Ruby Dynamite is a feminist. I’m subscribed to her YT channel. Dave. Why would you show a photo from 1926 as if it just happened yesterday? Every single person in that photo is dead. The only reason to show that particular photo would be to incite racial hatred and tension. It’s exactly the same as repeating the wage gap myth. So what’s the point of repeating an obvious lie? Power of course. The wage gap myth gave us the Lilly Ledbetter act, which requires an agency as an oversight comittee. Lotsa of money there. Lots more lawyers will be needed as well. That’s more money. No doubt some type of funding, possibly in the form of insurance will be needed for every company to ensure they comply with whatever is written in the act. Various security/investigative forces to determine possible culprits. Maybe programs and flow charts will be distrubuted to every company. Suffice it to say, many billions of dollars will be filtered to the top while the bill for all these useless, pointless measures will be sent to the bottom. By inciting the hate wage gap myth, which it is hate that’s being incited, wealth is sent to the top and billed to the bottom. It’s always in the best interest of the people at the top to incite as much hatred as possible. Investing ten million dollars in fraudulent studies and repeating the hate lie ad naseum will enrich the people at the top beyond belief. By posting, shall we say a misleading photo with this article, you’ve become a tool, promoting hatred for the people at the top. Look at it this way, Dave. If the mainstream media posted millions of photos and stories of people happily working/living together. That there is no wage gap, or systemic misogyny, no patriarchy, no all encompassing racism. Just a few isolated incidences here and there, not even worth mentioning. What if a man and a woman having an arguement wasn’t some monsterous DV drama blown out of proportions by the media? What if the truth was told by the media and politicians? Why the people might start to think that other than tossing thousands of drones at “suspected terrorists” in Yemen, we really don’t need the government at all. A picture tells a thousand words, Dave. In this case, a picture was used as a deception to promote hatred. Are you part of the solution, or part of the problem? Maybe next time, a few pictures of racial harmony? 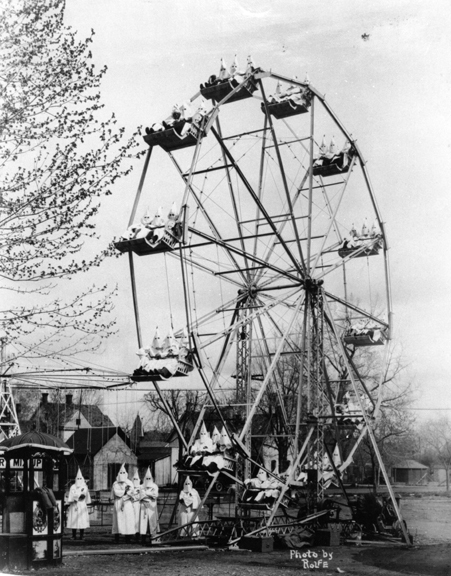 No one in the universe thinks that is a modern picture of modern klansmen on a modern Ferris wheel. Try again, please.